some of the finest milk chocolate filled with a golden cream of crunchy hazelnuts. 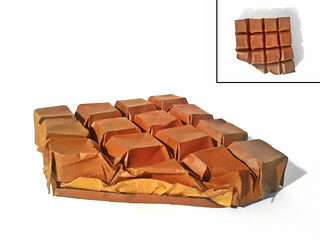 Chocolate - designed and folded by me. Paper: 17cm x 30cm painted tissue foil from origami shop. The paper was a lot too weak so it was very hard to shape. If you like this design please vote for me on the origami forum (snkhan.co.uk/forum/viewtopic.php?f=16&t=12626).